BC voters cast just under 1.8 million votes last night. About 910,000 were cast for elected MLAs, while 890,000 were cast for candidates who did not win election. This means that barely half the voters (<51% of us) are represented by an MLA we support. This is par for the course for First-Past-the-Post voting. 17 of the province’s 87 ridings had a winning margin of under 10%, and 7 had a margin of under 5%. This means that most ridings (70 of the 87) were pretty safe bets for the winning party. Indeed, of the 75 ridings whose names stayed the same since the last election, only 14 changed hands this election, with an average vote shift of only 7%. As we all know, currently only 9 votes stand between a minority government, possibly led by the NDP, and a majority government led by the Liberals. Indeed, a swing of under 500 votes (e.g., in Coquitlam-Burke Mountain, Richmond-Queensborough and Vancouver-False Creek) could mean the difference between a Liberal majority and an NDP majority, despite neither party having more than 40% of the vote. A proportional voting system would be much less sensitive to small vote shifts – to swing an election from a 50-40 majority to a 40-50 outcome would require a vote swing of more like 85,000 votes here in BC. Close to 57% of voters cast their votes for parties that explicitly promised to take steps to introduce proportional representation before the next election. Even if the Liberal Party ends up winning this election, this is an important milestone. The seat map is striking – the NDP won almost all the seats on Vancouver Island and across the central parts of Greater Vancouver, while the Liberal Party won all the seats in the eastern Fraser Valley and almost all the seats in the Interior. Does this reflect how people voted? Not at all. 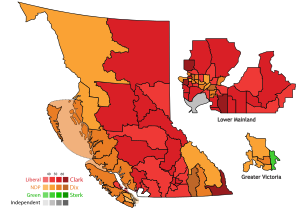 The NDP took two-thirds of the seats in the Lower Mainland and on Vancouver Island on 40-45% of the vote in these regions, while the Liberal Party took over 85% of the seats in the eastern Fraser Valley and the Interior on just over 50% of the vote. But in all these regions, the second party had close to 30% of the vote (and the Liberals had close to 40% in Greater Vancouver). Why should these voters not have an MLA who shares their political perspective? Such exaggeration is damaging to our ability to make good provincial policy decisions. Whoever forms government needs to hear from voices across the province. First-Past-the-Post silences those voices. The number of women in the BC Legislature increased slightly, from 31 of 85 to 33 of 87 (36.5% to 38%), which is a higher percentage than any other legislature in Canada (Ontario is second at 35%). Women represented 41% of the Liberal Party candidates, 51% of the NDP candidates and 38% of the Green Party candidates. This percentage is up by 10% on average over the 2013 numbers for the Liberal Party and NDP. However, women won only 30%, 46% and 33% of those parties’ seats, respectively, suggesting that perhaps the parties tended to place women in less winnable ridings (the Liberal Party’s gap of 10% suggests that they may have done this to a somewhat greater extent than the other two, who had only a 5% gap each). Nonetheless, the increase does confirm the importance of increasing the number of women nominated. But we can do better – some forms of proportional representation (e.g., STV) would ensure that virtually all ridings would be competitive, so we could remove that largely invisible barrier of ‘unwindable’ ridings. Another slightly bright spot was the (estimated) improvement in voter turnout – currently estimated at about 57% (up from 55% in 2013, and from 51% in 2009, but it hasn’t been above 60% since 1991 (64%)). While we wait for the final outcome of last night’s election to be decided, we will be hard at work preparing our Charter challenge, in which we will argue that our current voting system violates our charter rights to effective representation and equal treatment. So far, we have pledges of over $135,000 towards our goal of $360,000. Please help us reach this goal! The Prime Minister recently argued that the reason he called for a longer campaign was because the other parties are already campaigning on the public dime, implying that the Conservatives weren’t (at least, not to the same extent), stating that he thinks the parties should operate on their own resources and not rely on the taxpayer. However, Fair Voting BC’s analysis shows that the Conservatives receive a greater public subsidy than any other party ($55-75M in the past year, vs ~$35M for the Liberals and $25M for the NDP), raise a greater fraction of their total budget from public sources than the other parties (88-91%, vs 86-87% for the Liberals and NDP), and are expected to receive a much greater public subsidy per expected vote than the other parties ($12-17, vs $9 for the Liberals and $5 for the NDP). Our verdict: the Conservative Party is securing more public support in both absolute and relative terms than the other major federal parties. Read on for the details. Update: some of the sources we consulted to write this article did not list the numbers for the Green Party. We have therefore not been able to come up with as reliable an estimate for their subsidies as for the other parties, but have added those figures we have been able to ascertain. So, is the Prime Minister right to imply that the Conservative Party is much less reliant on public subsidies than the other parties, given that the Conservative Party has phased out the per-vote subsidy and expanded the spending limits for campaigns lasting longer than 37 days? Fair Voting BC is pleased to present a reality check [CBC asks a similar question]. Forms of Public Subsidy: Federal parties have historically received three forms of subsidies: (1) the per-vote subsidy, (2) tax credits to donors, and (3) reimbursement of 50-60% of campaign expenses (expenses incurred during a writ period). In addition, the government benefits from control over government advertising resources. 1. Per-Vote Subsidy: The Conservative Party has benefitted more than the other parties from the per-vote subsidy, receiving close to $100M from this source since 2004 (when it was implemented to compensate parties for losing access to corporate and union donations), while the Liberal Party has received about $75M, the NDP about $55M, and the Green Party about $12M. While the last per-vote subsidy payment was issued in spring 2015, these payments have certainly contributed significantly to the ‘war-chests’ of the various parties that they will be drawing on in this election campaign. 2. Tax Credits to Donors: When taxpayers give political parties $1.00, they are reimbursed up to $0.75, which can make the net cost to the taxpayer as little as $0.25. On average, parties receive $2 from the public purse for every $1 in net contributions from individual donors. In 2009, this subsidy totalled $30M for all parties [Wikipedia]. In 2014, the top three parties reported raising $20M (CP), $15M (LP) and $9.5M (NDP), so the corresponding public subsidies were on the order of $13M (CP), $10M (LP) and $6M (NDP). 3. Reimbursement of Campaign Expenses: The third main way in which the public subsidizes parties is by reimbursing over 50% of their campaign expenses. 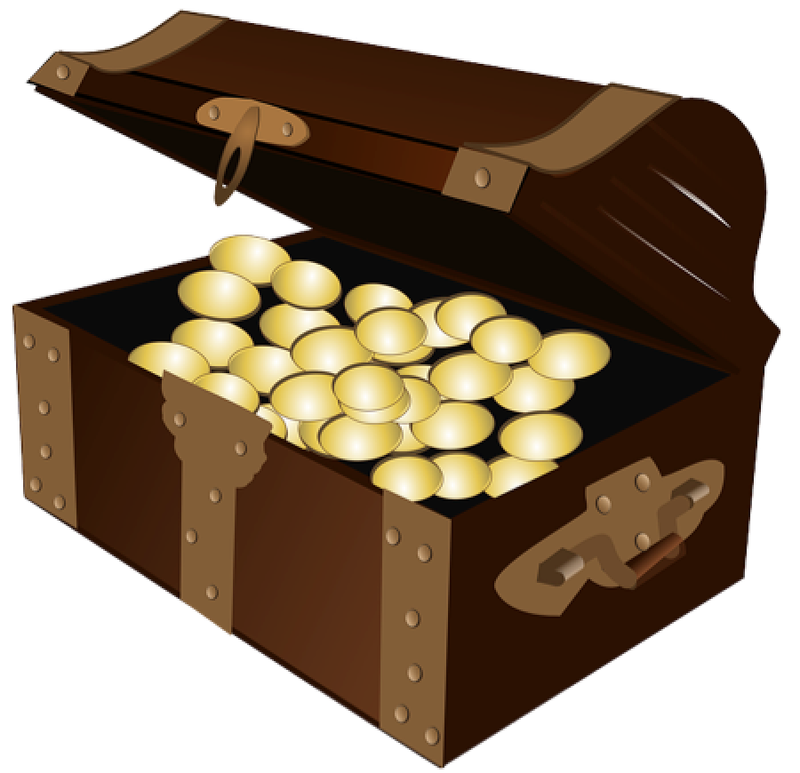 Estimating War-Chest Size: We have not been able to find current estimates of the size of each campaign’s ‘war-chest’, but the federal parties certainly accumulate significant resources between elections. It was recently reported that the parties ended 2013 with accumulated assets of $16.3M (CP), $9.4M (LP) and $5.9M (NDP) at the national level, with the CP holding another $15.8M at the local level and $4M held on behalf of the local associations. The LP and NDP had $8.1M and $4M, respectively, at the local level. In addition, the parties raised considerable sums throughout 2014 ($20M/$15M/$9.5M, respectively, and $3M for the Green Party) and have recently reported the results of their fundraising through the first two quarters of 2015 ($13.7M/$8.1M/$7.8M/$1.5M) [see Elections Canada files]. They therefore have about $70M, $40M and $27M available to the largest three parties (we have insufficient data to estimate the amount available to the GP), less any expenditures they have made over the past 18 months. Extended Campaign Limit Changes Only Affect Conservative Party: Under the current regulations, each party running a full slate of candidates is entitled to spend a maximum of about $25 million for a five-week campaign and each candidate about $100,000, or ~$34M in total for the 338 ridings (though parties will generally concentrate their local spending in the much smaller number of swing ridings to save on overall expenses). Under the recently passed Fair Elections Act, the government allowed the spending limits to increase for longer campaigns. Had the campaign been the standard five weeks in length, it is likely that only the Conservative Party would have been constrained in its spending. However, Prime Minister Harper’s decision to call an extended 11-week campaign means that the expenditure limits will roughly double, to about $52M per party and $210k per candidate ($71M total), effectively removing the constraint on spending the CP would otherwise have faced. Since no other party would likely have been restrained by the regular campaign limits, they will not gain any benefit from the increased limits and will simply have to spend their existing funds over a longer period. Subsidies: Since 50-60% of a party’s campaign expenditures are reimbursed, the Conservative Party therefore stands to recoup a larger amount of money than they would have with a shorter campaign period. We estimate that the three main parties will likely receive approximately $35M, $20M and $13M for the CP, LP and NDP, respectively, in expense reimbursement at the end of this year’s campaign (at $68M, this would be a considerable increase from the $48M these parties received following the 2008 election [Wikipedia]). The GP received $1.7M in reimbursement in 2008. 4. Use of Government Advertising Budgets: Although not normally considered to be a part of the election financing system, the governing party has access to a significant advertising budget while in office. Government advertising costs run to approximately $100M per year, with some of the largest contracts in 2012-13 being the Economic Action Plan campaign at $15M (for a program that had ended two years previously), Responsible Resource Development at $8M, and a campaign promoting tax cuts at $7M. The government recently spent $7.5M in May touting the success of the Economic Action Plan and an additional $13.5M to advertise its pre-election budget. At least some significant portion of this funding could reasonably be considered to be subsidized partisan advertising, especially when government representatives are not scrupulous in separating their partisan and official responsibilities, as Minister Poilievre was recently accused of when he wore a Tory golf shirt when announcing the government’s $3B child benefit payment program. In recognition of the potential for conflict of interest, the Ontario government requires the Auditor-General to approve all government advertising to ensure it is not partisan. 1. Subsidy by Party: The graph below shows the total subsidies by party for the three largest federal parties – it includes an estimate for the 2014 per-vote and donor subsidies, as well as an estimate for the 2015 campaign expense reimbursement subsidy, and assumes that $20M of the government’s annual advertising budget can be considered to be support for the governing party. From this graph, it is clear that the Conservative Party receives on the order of $75M in public subsidies in an election year ($55M if the government advertising subsidy is excluded), compared with about $35M for the Liberal Party and $25M for the NDP. We estimate the Green Party would have received under $5M in subsidies. 2. Ratio of Private Donations to Public Subsidy: The next graph shows the ratio of the net donor contributions to the total amount of money spent by a party in an election year – this ranges from a low of 9% for the Conservative Party if the government’s advertising is included (12% without) to a high of 14% for the Liberal Party (and 13% for the NDP). The Conservative Party therefore relies more on public subsidies as a fraction of their overall expenditures than the two other largest parties. 3. Public Subsidy Per Vote, By Party: Finally, we calculate the estimated amount of the public subsidy per expected vote in the upcoming election (using CBC’s PollTracker data from Aug 4 to estimate what fraction of the vote each party will win and assuming 15M voters). The final graph shows that Conservative Party is expected to receive a public subsidy of approximately $12-17 per expected vote (depending on whether or not government ad expenditures are included), while the Liberals will receive about $9/vote and the NDP about $5/vote. Verdict: So, to address Prime Minister Harper’s claim that campaign money should “come from the parties themselves [and] not from … taxpayer resources”, it is clear that all federal parties are heavily subsidized by the taxpayers, and the Conservative Party much more so than the others. Note: Arguable That Entire System is Publicly Funded: One significant use of party funds is to generate the donor funds that are so important to a party’s overall budget – $1 of net voter contribution gets multiplied three times due to the donor tax credit program and another two times by the campaign expenditure reimbursement program, for a total of $5 of public subsidy for every $1 of private contribution. Interestingly, the fundraising costs needed to generate these contributions are, on average, just about equal to the amounts raised [Wikipedia]. For example, in 2009, the Conservatives spent over $6M to raise about $5M in private funding, while the Liberals spent about $2M to raise $2.5M. Without the public six-fold multiplier, the federal parties would be unable to raise any significant amount of money directly from the public because the cost of their fundraising campaigns would consume the entire amount of the donations. In effect, since the cost of fundraising effectively cancels out the net amounts received, essentially all the funds that parties use to conduct their campaigns come from the publicly-provided pool. The only functional purpose of the fundraising system is to provide indirect guidance on how much the public wishes each political party to receive. Some have argued that it would be more efficient to use more direct approaches such as an annual check-off box on tax returns – this would be a useful thing for a future government to consider [Institute for Research on Public Policy, Flanagan and Coletto – U of Calgary]. As the election campaign unfolds, we will be sending out more frequent updates discussing issues particularly relevant to the campaign. Stay tuned! Campaign 2015 Kickoff – Where do the Federal Parties Stand? The NDP announced earlier this year that “an NDP government would introduce proportional representation by the next election.” The NDP also introduced a bill in Parliament last December that read: “(a) the next federal election should be the last conducted under the current first-past-the-post electoral system which has repeatedly delivered a majority of seats to parties supported by a minority of voters, or under any other winner-take-all electoral system; and (b) a form of mixed-member proportional representation would be the best electoral system for Canada.” Although this bill did not pass, MPs from 5 of the 6 parties (all except the Conservatives) voted in support of it. Although Justin Trudeau has explicitly stated both his opposition to PR and his preference for the non-proportional Alternative Voting system (i.e., using a preferential ballot to elect MPs in single-member districts), a number of individual Liberal MPs and candidates do support proportional representation. Most notably, BC MP Joyce Murray made PR a central plank in her bid for the Liberal Party leadership a couple of years ago, and both she and BC’s other Liberal MP, Hedy Fry (along with a bare majority of Liberal MPs across the country), supported last December’s motion by the NDP to implement MMP. Fair Voting BC has been working with Fair Vote Canada to collect commitments from individual Liberal Party candidates regarding electoral reform (Trudeau is allowing them to make up their own minds on this issue) and will publish this list shortly; we recommend that you only vote for Liberal party candidates who explicitly support PR, not just the process of review that is their party policy. The Conservative Party announced last week that they would “commit to legislation that would ban any government from changing our voting system without holding a referendum to secure the approval of Canadians first”, and that they would make no changes to first-past-the-post, saying “Changing the way Canadians elect their government is not a priority.” Given this clear signal that the party leadership thinks no change is necessary, and that no BC candidate has spoken out against this policy, Fair Voting BC cannot at this time recommend voting for anyone from the Conservative Party. In the coming weeks, we will be sending out more frequent updates discussing issues particularly relevant to the election campaign. Stay tuned! Join Us! 10th Anniversary Celebration of BC Citizens’ Assembly on Electoral Reform! We are delighted to invite you to join us in celebrating the 10th anniversary of BC’s remarkable Citizens’ Assembly on Electoral Reform at a dinner in Vancouver on Wednesday, December 10th [get your tickets here – only $40 in advance (includes a 3-course meal, plus a great group of speakers)]. Ten years ago, the BC government broke new ground in consulting citizens by establishing the Assembly. This was an independent non-partisan group of citizens drawn from across the province – one man and one woman from each of BC’s then-79 electoral districts, plus two Aboriginal representatives. The members were selected by lot from a list of citizens that reflected the gender, age and geographical make-up of British Columbians. The Assembly spent nearly a year meeting and examining in detail how the province’s current electoral system (Single Member Plurality, more commonly known as First Past the Post) worked and how it failed to support our citizens’ core democratic values. In the end, they recommended that BC adopt a new, more proportional way of voting known as the Single Transferable Vote that they felt would better support these values. As most of you know, STV was endorsed by nearly 58% of voters in 2005, but the government of the day had established a bar of 60% for adoption, so STV was not implemented. Despite the fact that their recommendation has not yet been adopted, the Assembly itself has proven to be very influential. Its design inspired the Ontario Citizens’ Assembly, and it has been cited as a model for a number of related citizen-focused consultation processes that have happened since, including Oregon’s Citizen Initiative Review, the move in California for a standing Citizens’ Assembly, the Dutch Citizens’ Assembly on Electoral Reform, Iceland’s Constitutional Assembly, and last year’s Irish Convention on the Constitution. Please join us for dinner and discussion on December 10th as we reflect on the BC Citizens’ Assembly and its influence on deliberative dialogue and citizen engagement around the world. We will also have some ‘participatory activities’ including an STV vote to determine what dinner is served (at the Pink Pearl Chinese restaurant in Vancouver) – this vote really matters! This will be a wonderful evening of good food and interesting conversation – don’t miss it, and invite your friends! 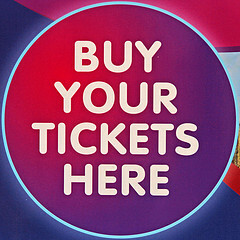 Tickets available by clicking the image above or here. Invite others to buy tickets at tinyurl.com/BCCA10thAnniversaryTix. Hope to see you in a few weeks! In our last couple of newsletters, we told you about our exciting Our City – Our Charter (OCOC) campaign to change Vancouver’s city charter so that we can seriously consider changing our voting system. Step 1 was to ask the candidates for their commitment to this goal. Change the Charter to allow the City to publish detailed, anonymized ballot data (as unanimously requested by Council in 2012). Vision, the NPA and the Green Party all responded on behalf of all their candidates that they agreed to reissue this call. Meena Wong (COPE mayoral candidate), as well as COPE Council candidates Wilson Munoz, Lisa Barrett, Tim Louis and Jennifer O’Keeffe, also agreed (no response was received from the other COPE Council candidates). Independent candidates Lena Ling, Mike Hansen, Grant Fraser and Rick Orser also agreed. No response was received by any other candidates. Fair Voting BC recommends that you take the commitments above into account as you vote this week – we are delighted to have received near-unanimous support for Charter change! Help us find non-profit organizations in Vancouver who might consider endorsing OCOC – just visit our Google Form and give us contact info for an organization you’re involved with (or invite them yourself). These could be political, cultural, social, charitable, faith-based or almost anything else – as long as you’re involved with them and think they might support a push for better, fairer elections. We’ll keep you updated as the election gets closer if any other candidates join the ones listed above in supporting Our City – Our Charter. In our last newsletter, we told you about our exciting Our City – Our Charter (OCOC) campaign to change Vancouver’s city charter so that we can seriously consider changing our voting system. We’re delighted to tell you that the OCOC website has just launched and we’re busy looking for endorsements. Help us find non-profit organizations in Vancouver who might consider endorsing OCOC – just visit our Google Form and give us contact info for an organization you’re involved with (or invite them yourself). These could be political, cultural, social, faith-based or almost anything else – as long as you’re involved with them and think they might support better, fairer elections. We’ll keep you updated as the election gets closer about who is supporting Our City – Our Charter. We hope you’ve all had a wonderful summer. Despite most people being on vacation, there’s actually been a lot to pay attention to, and two particularly exciting things coming up this fall that we invite you to join in on. Fall Preview – 2 Great Events, 2 Great Volunteer Opportunities! Fair Voting BC is planning two big events this fall – (1) the Our City – Our Charter campaign in conjunction with the fall municipal elections in November and (2) a celebration of the 10th anniversary of the BC Citizens’ Assembly in December. The biggest impediment to voting reform at the municipal level in BC is the current Local Government Elections Act (City Charter in Vancouver) that mandates use of First Past the Post or At-Large Bloc Voting. Ten years ago, Justice Tom Berger recommended that Vancouver ask Victoria to change the city charter. Vancouver has asked for this change several times, but Victoria hasn’t yet responded, so this fall we want to turn up the heat by building public support for the city’s request. Check out our draft OC-OC website, and sign up using the email signup button there to volunteer to help us reach out to the public and NGOs (please note that the map signup is in test mode at the moment – you can add a marker if you want, but it will be reset when the site goes live in a few weeks). 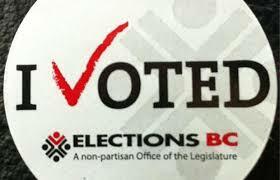 Ten years ago, BC broke new ground in citizen consultation by running the BC Citizens’ Assembly on Electoral Reform. This group of 160 citizens (one man and one woman from each riding around the province) spent the better part of a year listening to British Columbians about how we wanted our government to work and learning how voting systems can make government more responsive to voters. They came to a nearly unanimous recommendation for STV (the Single Transferable Vote), and voters endorsed it with 58% support in the 2005 referendum. Though the government of the day chose not to implement BC-STV, the Citizens’ Assembly was a remarkable and widely-respected consultative process that deserves to be celebrated and reflected upon, so Fair Voting BC will be hosting a celebration event on December 10th to remind the public about the Assembly. We’ve got a great lineup of speakers arranged, including former Attorney General Geoff Plant, the Citizens’ Assembly designer Gordon Gibson, Academic Director Ken Carty, political scientist Fred Cutler, assembly members Wendy Bergerud and Craig Henschel, and several others. We also have some extra surprises in store. To give this event the public impact we are hoping for, we need your help to put it all together. If you like networking, event organizing and publicity, please volunteer to help us make this an evening to remember by dropping us a note. The summer started (if you consider April summer!) with public protests about the so-called ‘Fair Elections Act’ passed by the federal Conservatives. Widely opposed by academics, most major newspapers, several former Elections Officers, many NGOs (including some in the US), and the opposition parties, as well as ostensible friends of the government such as Preston Manning and many of the government’s own Senators, the Conservatives finally amended the act to remove the most criticized provisions, but the act that was ultimately passed in May still complicates administrative processes in a way that is expected to deter voting and fails to give Elections Canada the powers the Chief Electoral Officer had requested to investigate electoral fraud. Two weeks ago, Conservative Party staffer Michael Sona was convicted of organizing fraudulent robocalls in Guelph aimed at voter suppression by misdirecting non-Conservative supporters to incorrect polling stations. While top-level party officials deny any involvement, the judge found that Sona was probably not acting alone. Ironically, there will likely be no further investigation because Elections Canada does not have sufficiently strong investigative powers, as they have been requesting since 2011. Sona will be sentenced in the fall. In a related case heard last year that was brought by the Council of Canadians, the judge found that widespread fraud had occurred in the 2011 election (there were reports of such calls in about 200 ridings) and that the most likely source of the information used to make the calls was the Conservative Party’s Constituent Information Management System. Ontario’s June election resulted in yet another example of a party winning undeserved majority powers – with only 39% of the popular vote, the Liberals took 54% of the seats, while the second place Conservatives, with 31% of the vote, took only 26% of the seats. On the positive side, Premier Wynne made a clear commitment to “give municipalities the option of using ranked ballots as an alternative to first-past-the-post in their own elections.” If they follow through, this could open the doors to similar changes here in BC – in particular, it could really help our Our City – Our Charter campaign. So, some mixed news, but also two great opportunities to make a difference this fall. Please consider volunteering either for the Our City – Our Charter campaign or for the Citizens’ Assembly Celebration – we really need your help to pull these off! January – BC Freedom of Information and Privacy Association (FIPA) filed a constitutional challenge in BC Supreme Court of the Liberal government’s ‘gag law’ that prevents individuals and non-profits from expressing political opinions in public without registering as an official political advertiser. January – Samara Canada ran a survey asking public and politicians for suggestions on Redesigning Parliament; check out their final list of 50 ideas in six broad areas. February – LeadNow and Project Democracy endorsed Joyce Murray‘s run for Liberal Party leadership because of her commitment to electoral cooperation and implementing voting reform. April – The Conservatives pulled their democratic reform bill that was intended to give Elections Canada enhanced investigative and enforcement powers; no date for reintroduction has been announced. It is now nearly a year and a half overdue. April/May – Fair Voting BC runs “Deepening Democracy” survey of provincial candidates in the runup to the May election. April/May – Fair Voting BC runs “Our City, Our Choices” campaign aimed at getting the provincial government to respond to Vancouver’s four-times-issued request for more autonomy in how the city holds elections. May – Federal Judge Richard Mosley rules in a robocalls-related court case that there had been orchestrated and widespread fraud in the last federal election, but insufficient evidence with regard to consequences to justify annulling election results. “The evidence points to elaborate efforts to conceal the identity of those accessing the database and arranging for the calls to be made.” [Judgement] The plaintiffs then decide they won’t appeal to the Supreme Court. May – The federal NDP passes a resolution supporting proportional representation. June – The Ranked Ballot Initiative of Toronto (RABIT) succeeds in persuading Toronto City Council to ask the province for permission to adopt a ranked ballot for municipal elections (as in BC, the province has not yet responded). August – The government prorogues parliament, allowing Bill C-21 (intended to close a loophole on political loans) to die for a fifth time. September – The federal NDP announces that they will run on a platform of electoral reform in 2015; NDP MP Craig Scott (Democratic Reform critic) starts a nationwide road trip focussed on democratic reform; look for BC visits in the spring. September – Fair Vote Canada launches their “Make Every Vote Count” campaign, starting the runup to the 2015 federal election. September – Elizabeth May launches her “Save Democracy from Politics” nationwide tour. October – The Quebec Appeal Court declares proposed federal reform plans unconstitutional. October – The BC Independent Panel on Internet Voting issued its preliminary report which recommends against using internet voting for the foreseeable future; Fair Voting BC submits response supporting main findings, but calling for increased use of electronic means for public consultation and pointing out that security concerns would be considerably reduced if we used proportional representation. October – Elections Canada sets up an all-party Advisory Committee to review and advise on conduct of federal elections. November – BC FIPA presents arguments in BC Supreme Court challenging the ‘gag law’; ruling expected in early 2014. December – Independent MP Bruce Hyer (formerly an NDP MP) joins the Green Party, citing its commitment to democratic representation. December – Fair Vote Canada director John Deverell becomes Green Party critic for Democratic Reform. With various court rulings coming out this spring, the municipal elections in the fall and planning for making voting reform a major issue in the 2015 federal election all underway, we expect 2014 to be an exciting year for democratic reformers and we look forward to playing a significant role in driving reform efforts forward in the coming year. We hope you’re all having a wonderful summer. I started writing this newsletter in Ashland, Oregon, where we’ve been staying at a lovely B&B and having many interesting conversations with people from all across the US about politics and democracy in our two countries. One of the things that has most struck me is the level of despair and cynicism many Americans feel towards their voting system. Currently, the big news in the US about voting is linked to the recent US Supreme Court decision striking down an important provision in the 1965 Voting Rights Act that was widely credited with dramatically increasing African-Americans’ access to voting by providing federal oversight of new voting laws in states with a history of disenfranchising minority voters. Since 2006 alone, the US Department of Justice has struck down 31 attempts to change voting laws, almost all in the US south, but with the recent 5-4 decision, these states are now free to implement discriminatory laws aimed at suppressing minority voters without fear of being overruled at the federal level. Indeed, North Carolina has very recently passed the first of the post-decision laws that will soon require voters to produce acceptable state-issued photo ID in order to vote. While seemingly benign (who doesn’t have photo ID these days? ), there is considerable evidence that this kind of law will have disproportionate effects on the poor, people of colour and women. Among the reasons are that poorer people are much less likely to have a valid driver’s license and women are more likely to change their names through marriage or divorce, thereby rendering their previous ID invalid. In fact, the prestigious Brennan Center at the New York University School of Law has reported that fully a third of US women of voting age do not currently have acceptable ID that would allow them to vote. The Brennan Centre study also found that over 11% of Americans don’t have acceptable photo ID, 18% of seniors, 25% of African Americans, 18% of young people (18-24) and 15% of low-income people, and a North Carolina study shows a strong partisan bias (nearly 70:30 against registered Democratic Party supporters). These kinds of voter ID laws are part of an overall voter suppression effort in the US that includes other administrative measures (typically executed by party-affiliated elections officials) such as purging the electoral rolls of voters of colour (done without notification, which leaves voters without recourse on voting day), redrawing electoral boundaries to eliminate office-holders of colour, and moving polling places to make it harder for targeted groups to vote. While proponents claim that the purpose of the law is to prevent “rampant and undetected” voter fraud, a study by Arizona State University found that there have been only ten cases of in-person voter fraud in the USA since 2000 (for an entertaining account of voter suppression activities in the USA, we recommend “Billionaires and Ballot Bandits” by BBC investigative journalist Greg Palast). The North Carolina law also contained measures eliminating pre-registration of high school students and voting day registration (which means that if an irregularity is found on voting day, the voter is out of luck as they will have no mechanism to correct the problem). Fortunately, there has been some pushback. Former Republican-appointed Supreme Court Justice John Paul Stevens has issued a harsh rebuke to the Court. The American Civil Liberties Union (and possibly the NAACP) plan to launch lawsuits. And the US Department of Justice has just filed suit against Texas [also see this article in The Atlantic], so we have some hope that some sanity may eventually prevail down south. All of this news about the assault on voting rights in the US have got us here at Fair Voting BC increasingly thinking about dealing with voting reform as a civil rights issue. We all believe deeply in democracy – that is, that legitimate power must flow from citizens to our representatives and that citizens should be treated equally in this process. But perhaps we’ve been too timid. We keep trying to persuade the public and the political powers that our democracy would be better if we had a fairer, more democratic voting system. But women would never have received the vote if they had simply tried to persuade men that society would be better if men would allow them to vote. Rather, the suffrage movement won enfranchisement for women precisely because they wouldn’t take ‘No’ for an answer. Not that change came quickly – the Canadian Women’s Suffrage Association was formed in 1883 and it took 33 years, until 1916, for women to win the right to vote in provincial elections in Manitoba, Saskatchewan and Alberta (followed by BC in 1917 and Canada in 1918), and (embarrassingly) not until 1940 for women to finally be able to vote in Quebec. So, is our demand for a new way of voting in any way similar to women’s suffrage? We believe there are strong parallels. With our current Single Member Plurality voting system, only half the voters are represented. Women’s enfranchisement doubled representation from 25% to 50% – adopting proportional representation will double it again, taking us to close to 100%. We also have a potent new legal weapon at our disposal. When women won the vote, Canada was still governed by the British North America Act, but since 1982, as last year’s 30th anniversary of the Canadian Charter of Rights and Freedoms reminded us, we now have a charter that grants us fundamental democratic rights – specifically, Section 3, which asserts our right to vote. The idea that our current voting system systematically violates the “Canadian ideal of effective representation” has not yet been tested in court, so we plan to explore (with the help of legal scholars and advisors) whether we could possibly successfully make this case. Stay tuned as we learn more. In other news, the Irish Constitutional Convention (very similar in some ways to our own BC Citizens’ Assembly – made up of 66 randomly selected citizens, 33 parliamentarians and a chair) overwhelmingly reaffirmed their commitment to STV and recommended a new citizen initiative process. A UK study on election spending [PDF] put out by the Electoral Reform Society showed that there were huge disparities in how much political parties spent in different ridings – varying by over 20 times from the least to the most contested ridings. This is a graphic illustration of how irrelevant voting is in the many safe ridings in elections under our current Single Member Plurality voting system and why we need to change to a system where all votes (and voters!) are equally valued. Finally, we strongly recommend that you read political scientist Adam Kingsmith’s eloquent defense of the proposition that we aren’t apathetic, just sick of the political status quo, and his call to action. Sorry about the longer-than-usual long newsletter, but we’ve gotten well-rested over the summer and have lots to share with you. We hope you find it interesting as you turn your thoughts to the beginning of the new working and school year. Half Of Us Are Orphaned Voters: As is typical, 49% of voters are now ‘represented’ by someone they did not vote for. There is no excuse for disenfranchising so many people when almost all other advanced democracies vote in ways that guarantee that nearly all voters help elect a candidate they support. If we were using the Single Transferable Vote recommended by the BC Citizens’ Assembly, we estimate that close to 90% of all voters would now have a representative they’d voted for. No Majority From Voters: As always, seat results bear scant relation to the popular vote results. In this election, the BC Liberals won 59% of the seats on 44% of the vote – a seat bonus of over 33%. Despite the voters not giving the Liberals majority support, the party will now control a solid majority of the seats and will have the power to do as they wish for the next four years instead of being in the position they actually earned – i.e., the senior partner in a government that would have to consult beyond its own party boundaries to win sufficient support to pass legislation. Over-Influence From Swing Ridings: Somewhat lost in the post-election discussion is that the outcomes in three quarters of the ridings in the province were never really in doubt. In Rafe Mair’s memorable phrase, a “fencepost with hair” could win in certain ridings if the right party label were attached. 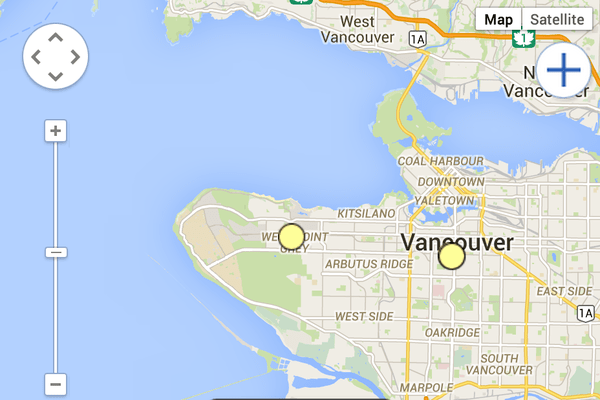 The election was really decided in about a dozen ridings, largely in the Lower Mainland and central BC. If 3000 voters in the 10 closest ridings in the province had voted for the NDP instead of the Liberals, we would now have an NDP majority government. In other words, a shift of under 0.2% in the popular vote in the ‘swing ridings’ could have moved 10% of the seats to the NDP. This pathological hypersensitivity of our voting system makes a mockery of most of our votes – regardless of which party or candidate we support, if we live in the safest 70 of the province’s 85 ridings, there was relatively little point in voting. Regionalization: Just like on the national stage, where the Bloc Quebecois dominated Quebec for years, the Reform, Alliance and Conservative Parties dominated the Prairies and the Liberals once dominated Ontario, here in BC our voting system means that Liberal party supporters have no representation throughout most of Vancouver Island and the North Coast, NDP supporters have no representation in central BC and the Fraser Valley, and Conservative and Green supporters have no representation anywhere outside of Oak Bay. A more proportional voting system would have given supporters of the two major parties representation in every region of the province and increased the chances that Conservative and Green voters would be represented at least in their areas of greatest strength. Poor Representation: The key idea behind proportional representation (PR) is that each voter is equally entitled to a representative of their own choosing. While party affiliation is the most common way to assess this, sociocultural aspects of representation are equally important. Our current voting system tends to encourage the election of middle-aged or older white men – roughly 30 of the 50 Liberals and half of the NDP are (arguably) in this category, even though middle-aged+ white men only make up about a quarter of BC’s population. South and East Asians make up nearly a quarter of the population, but only 12% of the MLAs, and no aboriginal MLAs were elected, despite aboriginals comprising 5% of the population (see census data). There was a bit of good news in terms of gender balance, though – the BC legislature broke 33% representation by women for the first time, but there’s still a ways to go to achieve parity. More proportional voting systems that encourage parties to put forward more diverse slates (in terms of gender, age, ethnicity and other factors) are needed to make more progress here. Voter Turnout: Although news reports seem to be saying that turnout went up slightly over 2009, we calculate that it possibly dropped to under 50% for the first time ever. The reason for the discrepancy is that the reported figure for 2013 (52%) appears to be the percentage of registered voters, while the figure for 2009 (51%) is the percentage of eligible voters (i.e., registered + unregistered). About 5-10% of eligible voters usually don’t get registered, so the turnout figure for eligible voters is typically 2.5-5% lower than for registered voters. While not as large a drop as from 2005 to 2009 (58% to 51%), it still indicates that, even in a close election, a decreasing number of us find it worthwhile to vote. All of these results are absolutely typical of our current voting system. Interestingly, Premier Clark understands this perfectly. Just before the 2009 election, she argued strongly that voters should support STV. We recently issued a press release asking: Now that the Premier has the power to make the necessary changes, does she have the courage of her convictions? Help Build the Reform Movement – Share This Newsletter! While you’re waiting for the FVC AGM, one of the simplest things you can do to help us build public support for changing how we vote is to introduce someone you know to Fair Voting BC. If you’ve spoken to someone in the last few days about how unfair our recent election was, please send them this newsletter as a follow up and invite/encourage/beg/plead with them to sign up for our newsletter by visiting our website and clicking on the ‘Subscribe to our Monthly Newsletter‘ button. Then you can feel as virtuous as you did when you slapped on an “I Voted” sticker last week! While the BC election certainly captured our attention in recent weeks, there’s lots happening around the country. A few quick highlights: Vancouver last week announced the 16 top recommendations of its Engaged City Task Force [download report – PDF], the Federal Court hearing the Council of Canadians’ case against the Conservative Party’s robocall shenanigans found that serious fraud had occurred (though the judge shied away from annulling the election results) [see stories in Rabble, National Post and Globe & Mail], the BC Freedom of Information and Privacy Association’s challenge of the government’s gag law has been delayed, and the BC Internet Voting Panel is about to hold the first of its final set of three meetings over the summer, with an interim report scheduled for release in August – we’ll update you on all of these stories as we learn more. What Was the Turnout in 2013 Anyway? Update: Now that final voting results have been reported, we have updated the calculations described below. Please check the end of this post for the update. Leaving aside the fact that the estimate for eligible voters in 2013 is out of date by eight months and that the number of voters who ultimately registered must have increased over the past month, we see that the reporters appear to be comparing the turnout of ELIGIBLE voters in 2009 (51.0%) to the turnout of REGISTERED voters in 2013 (52.4%). The more accurate comparison is between turnout of eligible voters; on this basis, there is clearly a drop of at least 1.8% from 2009 to 2013 (ie, to 49.2%). This makes perfect sense – BC’s population increased by over 200,000 people, the number of eligible voters rose by at least 70,000 (and more likely closer to 100,000, if we account for the additional eight months that have elapsed since the last estimate), and the number of votes cast dropped by over 20,000 (though some more mail-in ballots are yet to be counted – these accounted for about 2% of the ballots in BC in 2009, according to a 2012 article in the Parliamentary Review, which would represent about 33,000 votes this year). If we account for the increase in the number of eligible voters over the past eight months and the mail-in ballots not yet counted, our final estimate of the turnout of eligible voters is still just under 50% (49.9%, to be more precise). In summary, voter turnout appears to still be dropping, despite news reports to the contrary. If you are aware of any data to the contrary, please let us know. We were a little surprised, but pleased, to learn that the final vote counts were a fair bit higher than we’d originally estimated. It appears that more voters voted in advance, by mail or at different polling stations than had happened previously. 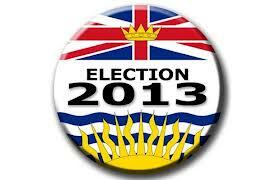 According to Elections BC, the final count was 1,803,051, up over 9% from 1,651,567 in 2009. Extrapolating the number of eligible voters from last fall until this May, we estimate a number of 3.325 million, which means that turnout rose to approximately 54.5% (we have not yet been able to find a reliable figure for the final number of registered voters). Also, the final popular vote results were: Liberals 44.1%, NDP 39.7% and Greens 8.1%. According to Fair Voting BC, regardless of which party won the most seats last night, it was certain that half the voters would remain unrepresented for the next four years. Voter turnout in last night’s election also dropped significantly and ended up below 50% for the first time (~49% vs 51% in 2009). Initial estimates suggest that 10,000 fewer people voted this year, despite BC’s population growing by over 200,000 people during the past four years. Now that Ms. Clark has been re-appointed Premier, she has the power, the responsibility and a rare opportunity to revitalize our democracy. Fair Voting BC asks the Premier, does she have the courage to take on the established interests and follow through on her convictions about the deep and abiding need for voting reform? In the last election I voted against STV. I even campaigned against it. The single transferable vote, an idea that was launched by an assembly of non partisan everyday citizens, didn’t appeal to me. At the time, I believed my vote was the right one because I liked the current system of selecting MLA’s. Looking back, I realize I liked our current system because it served my interests well. I was an elected politician who had been chosen under the first past the post system. I, like many of the entrenched interests who are today fighting against STV, didn’t see a need to change a system that was working – for me. But since I have left politics my view has changed dramatically. Part of it has been due to the fact that I sit here in this chair at CKNW every day and hear from you. What do I hear? I hear that people are sick to death of the way our political system operates. People tell me they’re sick of seeing their vote thrown in the garbage if they live in one of the 2/3 of ridings that are safe and they didn’t happen to vote for the incumbent party. They’re tired of electing politicians who ignore what their constituents want and do what their leaders want them to instead. And I hear that people have had it up to here with politicians who attack each other relentlessly in an endless vitriolic war of words that poisons us all against our democratic process. I have learned through my own experience in radio and in politics that while those are all things that likely bother you, they don’t for one moment bother the hacks, the backroom boys, and the politicians who are served and elected by our current system. And when I look at so many of the people who are actively campaigning against STV, some of whom you often hear on CKNW, that is what I see: strategists and interest groups who have grown accustomed to the power the current system grants to them. I see people whose interests and in many cases, whose income is dependent on keeping our system the way it is. People who, unlike you, relish the ugly realities that are the consequence of our first past the post system. They are fighting STV because the change it will bring frightens them. Second, politicians will be forced to listen to their communities first and their leaders and parties second. When you vote you will have several choices to pick from your favourite party. If, for example, you are a committed BC Liberal wouldn’t it be nice to be able to choose from among them the one who was brave enough to stand up for you and against his or her party and stop the road, prison, or big polluter from going through your back yard? Wouldn’t it be nice to choose the one who actually listened to you between elections? Third, because STV will give you choices from among individuals, and you will have the choice to select the one you think is the smartest, most ethical, someone you can respect. How many times has a political party in your riding foisted a candidate on you who is an embarrassment but whom you vote for anyway because they are with the party you like? Say good-bye to voting for bumblers who are destined for the backbench, because with STV you get to choose the best person not the party back roomers. Fourth, the level of hateful invective will diminish radically. Under STV all politicians will have a strong incentive to get along better. They will be hoping to be the second or third choices of their opponents and supporters. The toxic insults and nasty rhetoric will be turned to a lower volume as politicians stop trying to win by ruining their opponents and instead start acknowledging them. To me this is the biggest most important change that STV will bring about: civility in politics. I believe we need a new civility in our society and politics is where it can begin. On Tuesday you will make two choices. The first is a short term choice of who will run our system for the next four years. You will vote for someone who has been chosen for you by entrenched interests in a big party machine. They will be someone who will be accountable to that machine, not to you. And perhaps some of the people you vote for will get elected not because of who they are but because they have proven to be the best at slinging mud. The other vote you will cast will be the much more important one. It will be the vote that determines if next time you will be faced with exactly the same ugly choices, or if you get to make the choices yourself. Einstein once said that the definition of insanity is doing the same thing over and over again and expecting different results. We have a choice, perhaps a once in a lifetime choice, to do things differently. We have a chance to change our political system and remake it into one that we can have some measure of faith in. If the established interests succeed in defeating this on Tuesday, they won’t give you another chance. I hope British Columbians take this chance for real change. I hope we take this chance and vote for STV on Tuesday May 12. Fair Voting BC and Fair Vote Canada recently asked BC’s political parties and candidates 22 questions about how they would “Deepen Democracy” in Engagement, Representation and Accountability. NDP: The NDP’s two major commitments are to pre-register 16 and 17 year olds to encourage young people to vote, and to eliminate union and corporate donations. They also plan to put government advertising under the control of the Auditor General, to empower legislative committees and to enhance the powers of local governments, among several other proposals related to accountability and shifting decision-making closer to the communities involved. Greens: The Green Party promises to exempt small entities from the so-called ‘Gag Law’, review the Initiative Act to make it more usable, pursue voting reform, empower legislative committees, eliminate union and corporate donations and establish a Legislative Budget Officer. Liberals: The Liberal Party promises to implement the majority of the recommendations from its 2010 Local Government Elections Task Force, but had no comment on the remaining issues we asked about. Conservatives: The Conservative Party submitted no response to our survey. Aside from the responses of the larger parties, many independents, smaller parties and individual Green Party candidates provided detailed and thoughtful responses to most or all of our full set of questions (see detailed responses at fairvotingbc.com). Full details on the “Deepening Democracy” survey are posted at fairvotingbc.com/deepening-democracy/2013-deepening-democracy-survey-responses. Our City, Our Choices – City Hall is Unanimous; Why Won’t the Province Agree? Each of these times, Vancouver City Council has unanimously agreed that the city needs the power to set voting rules and/or campaign financing regulations to deal with our unique challenges as the largest metropolitan centre in the province, and each time the city’s request has been ignored or declined. Full details on the “Our City, Our Choices” survey are posted at fairvotingbc.com/our-city-our-choices. A Huffington Post article today reported that outside groups spent over $1B in last year’s US presidential election, largely without transparency and oversight. Closer to home, the Vancouver Park Board recently passed a motion calling on the BC provincial government to implement campaign finance reform; their motion was endorsed by Integrity BC, which has a petition underway calling for such reforms. Note: This message is particularly intended for people who are open to supporting the federal Liberal Party, but we trust that democratic reformers anywhere on the political spectrum will be interested in hearing about the current Liberal leadership contest and its implications for moving on electoral reform. Groups Endorsing ‘Electoral Cooperation’: You have likely seen the headlines recently announcing a wave of endorsements for the idea that the federal Liberals, NDP and Green parties should work out a cooperation agreement in the next federal election in 2015. In particular, LeadNow and Avaaz are currently running strong campaigns advocating this idea. FVBC is Non-Partisan: As you know, Fair Voting BC is a non-partisan organization and does not advocate on a partisan basis for any particular party or candidate. For this reason we do not take a stand on cooperation as a mechanism for achieving a partisan goal (in this case, for defeating the Conservatives). Nonetheless, we do believe it is acceptable to assess and discuss any proposals for achieving electoral reform. Why Cooperation Idea Is Interesting to Reformers: The current call for cooperation has two main components of interest to democratic reformers: (1) a tactical approach to attempting to ensure that a particular partisan grouping wins seats more proportional to their combined level of popular support, and (2) a route to implementing voting reform that would potentially eliminate any future need for such tactical maneuvers. Tactics Not Primary Concern: The tactical issue, while interesting to discuss, is not our primary concern at the moment, although we certainly affirm the right of political candidates to act within electoral rules and to reach out across party lines to maximize their chances for election. Joyce Murray Offers Possible Route to Electoral Reform: The more pressing current issue is how a cooperation agreement might lead to meaningful voting reform. As most FVBC supporters will no doubt remember, BC MP Nathan Cullen staked his run for the federal NDP leadership on the idea of a cooperation agreement and received considerable support. Further, he argued that, if successful, a cooperation government would immediately work to implement some form of proportional representation. Now, BC MP Joyce Murray, alone amongst the field of eight candidates running for leadership of the federal Liberal Party, is issuing a similar call. Liberal Leadership Vote Open to All: What makes Murray’s call particularly interesting is that the Liberal Party has opened voting in its leadership contest to non-party members – in effect, they have decided to run what would be considered in the US a kind of open primary. In order to vote in the upcoming leadership contest, one simply has to sign up (for no charge) as a ‘supporter’ of the Liberal Party. To be eligible, you have to be over 18, eligible to vote in Canada and not currently be a member of another federal party. What’s additionally interesting is that each riding in the country has equal weight in the leadership race, regardless of how many supporters there are in each riding. So, if there aren’t too many Liberal supporters signing up in ridings such as Skeena – Bulkley Valley, Kootenay – Columbia or Okanagan – Shuswap, your vote could carry significant weight. Signup Deadline Imminent: The deadline for signing up is this coming Sunday, March 3rd, so if you’re interested, you should sign up immediately. While Fair Voting BC is not endorsing Murray in this contest, we do point out that she alone amongst the candidates is promising to work towards proportional representation, so if you are comfortable with the idea of supporting a Liberal candidate and are interested in finding one who supports proportional representation and has a plan for achieving it, she certainly merits your detailed consideration. We therefore recommend that you read her democratic reform proposal and, if you like what you see, sign up to support her candidacy. You can sign up either on her site or at the main Liberal party site – your choice. Click here for a CTV newstory from yesterday about the groups endorsing Murray. We emphasize again that Fair Voting BC is not endorsing the Cooperation campaign, Joyce Murray or the Liberal Party of Canada, but is simply pointing out that democratic reformers who would consider becoming Liberal Party supporters take a careful look at what Ms. Murray is promising to do about voting reform. Three times now, Vancouver City Council has unanimously voted to ask the province to approve Justice Thomas Berger’s 2004 recommendation that it allow Vancouver to choose its own voting system, but it has yet to receive a reply. In 2010, the province appointed the Local Government Elections Task Force to make recommendations relating to municipal elections, but they specifically excluded voting reforms. Since the Task Force’s recommended measures are supposed to be introduced in the upcoming legislative session, Fair Voting BC met with Premier Christy Clark to solicit support for Vancouver’s thrice-issued request for increased autonomy. The Premier sounded favourably inclined, but referred us to the minister responsible – Minister of Community, Sport and Cultural Development Bill Bennett. We were therefore very disappointed to get a note from the minister recently telling us that the government won’t be considering any voting-related reforms for the foreseeable future. As the May election approaches, we urge reform supporters to pressure your candidates to finally grant Vancouver’s longstanding request. Update: The government very recently announced that they won’t be able to implement any of the Task Force’s recommendations at all in the current legislative session. NDP leader Adrian Dix pledged to make implementing these recommendations a priority if he is elected. Fair Voting BC was an intervenor last fall when the BC government lost yet another bid to have the Court accept their gag law. However, the Court’s ruling didn’t address our most significant concerns – namely, that the current law imposes unconstitutional restrictions on small entities. The way the Act reads now, any communication with the public during an election period that is in any way related to an election issue or candidate counts as “election advertising”, so you must register with Elections BC – even if you didn’t spend a penny. As the Chief Electoral Officer said in his 2010 report, this means that if you so much as put a handwritten sign in your window without registering with Elections BC, you risk a $10,000 fine and/or a year in jail. This is an obvious and serious affront to free speech in BC. We are therefore delighted to let you know that our co-intervenor, the BC Freedom of Information and Privacy Association, has filed a Charter challenge in BC’s Supreme Court seeking to have the law struck down if the government fails to make amendments that respect citizens’ rights to free speech. Full information on the case can be found through FIPA’s website. The BC team of the Federal Electoral Boundaries Commission (EBC) released their federal ridings redistribution report on January 28th. In October, Fair Voting BC had asked them to follow the Nova Scotia Provincial EBC’s lead in recommending that the legislature consider how adopting proportional representation could substantially simplify and reduce the need for future changes to electoral boundaries. Unfortunately, the BC EBC did not take our advice, although they briefly noted that “there were recommendations about changing the present first-past-the-post electoral system to provide for some form of proportional representation” without specifying the linkage between these recommendations and the implications for boundary-setting processes. As if one robocall scandal weren’t enough, the Conservatives last week denied, then admitted, that they were behind robocalls in Saskatchewan aimed at interferring with the non-partisan Electoral Reform Commission’s proposals for redistributing seats in Saskatchewan. Despite the fact the calls purported to come from an independent research company and did not alert those called that the Conservative Party had designed the ‘poll’ and was funding the calls, in contravention of CRTC regulations, the Prime Minister asserted that his party had followed the rules. Liberal MP Ralph Goodale has asked the CRTC to investigate. The Conservative Party continues to deny that they had any involvement in the robocalls made in the 2011 federal election that provided misleading information to non-Conservative supporters about supposed changes to their polling booth locations. At the end of November, Elections Canada revealed that they were expanding their investigation of this into at least five different provinces involving over 50 of the countries 308 ridings. More recently, court documents show that Elections Canada has obtained phone records for Rogers customers (in addition to Shaw and Videotron customers). Meanwhile, the court case brought by the Council of Canadians relating to six specific ridings was argued in Federal Court in Ottawa in December. The plaintiffs argued that the election results should be annulled in these ridings – the judgement is forthcoming. Canada’s Chief Elections Officer has recommended various legal changes aimed at minimizing or preventing such abuses in the future. See related story in the Ottawa Citizen. Meanwhile, Democracy Watch has filed a complaint claiming that Elections Canada has not released its findings on a wide variety of electoral complaints. Preston Manning: Redesigning Parliament? How about redesigning parliamentarians? Reinventing Parliament: What’s the one thing you would change? In more local news, Vancouver announced the 22 members of its Engaged City Task Force last month. Although the members of this task force have impressive pedigrees in citizen engagement, there was a lack of transparency in the selection process. Some significant unanswered questions: Who applied but was not chosen (eg, there are no members with an explicit focus on changing the electoral system to improve representation)? Are there significant unrepresented groups? (The Georgia Straight reported that indigenous activist Scott Clark was concerned that there are no aboriginal representatives). And will the Task Force carry out any of its deliberations in public, invite input from the public or publish its preliminary recommendations for public comment prior to issuing its final report in June? In the Straight article, Reimer is quoted as saying that “during the task force’s first informal meeting, members expressed an interest in incorporating the perspectives of groups not represented on the committee.” This is promising, but Fair Voting BC urges the city to take this opportunity to be as inclusive and open as possible in its deliberations. Finally, we are delighted to announce that there is a new Vancouver chapter of our sister organization, Fair Vote Canada. FVBC board member Stuart Parker is the chapter president and they have several exciting initiatives getting underway, including a new study of options for electoral reform in the city of Vancouver that won’t require changes to the city charter. 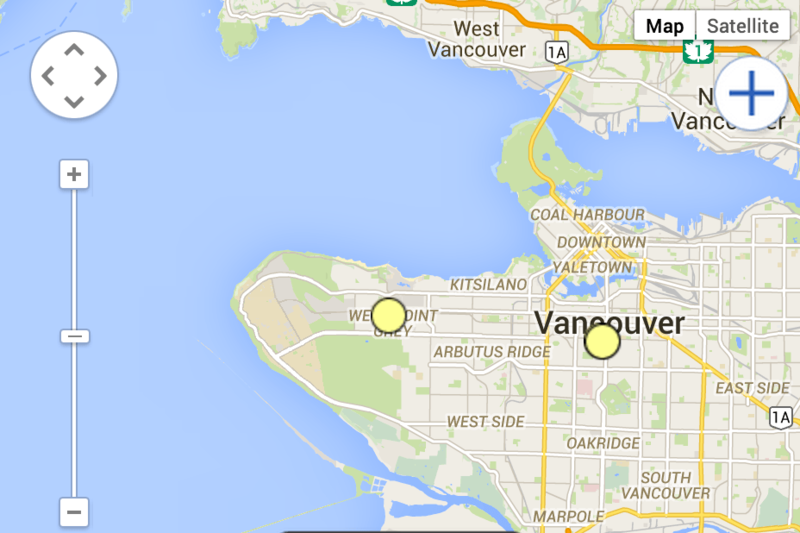 Anyone interested in getting involved with FVC-Vancouver is invited to contact Stuart. Fair Voting BC was an intervenor last fall when the BC government lost yet another bid to have the Court accept their gag law. However, the Court’s ruling didn’t address our most significant concerns – namely, that the current law imposes unconstitutional restrictions on small entities. The way the Act reads now, any communication with the public during an election period that is in any way related to an election issue or candidate counts as “election advertising”, so you must register with Elections BC – even if you didn’t spend a penny. As the Chief Electoral Officer said in his 2010 report, this means that if you so much as put a handwritten sign in your window without registering with Elections BC, you risk a $10,000 fine and/or a year in jail. This is an obvious and serious affront to free speech in BC. We are therefore delighted to let you know that our co-intervenor, the BC Freedom of Information and Privacy Association, has filed a Charter challenge in BC’s Supreme Court seeking to have the law struck down if the government fails to make amendments that respect citizens’ rights to free speech. Full information on the case can be found through FIPA’s website. The B.C. Freedom of Information and Privacy Association has filed a Charter challenge in B.C. Supreme Court in response to the provincial government’s refusal to fix unconstitutional third-party advertising provisions in its Election Act. As it stands, the Act states that during an election period, any communication with the public that’s in any way related to an election issue or candidate counts as “election advertising”. This means that before you do something as small as putting a handwritten sign in your window, you must first register with Elections BC. If you don’t, you risk a $10,000 fine and/or a year in jail. While many jurisdictions across the country have their own third-party advertising regulations, designed to stop big corporate and union donations from unfairly influencing elections, British Columbia is alone in its refusal to implement a lower limit for registration. During federal elections, the government doesn’t require registration unless you spend over $500 on your election “advertising”. In Alberta, the cutoff is even higher, set at $1000. This is a balanced approach that keeps large election spending accountable and transparent while not interfering with the political speech of individuals and small groups. Unfortunately, B.C.’s provincial government has gone out of its way to avoid adopting this standard. FIPA has been pressing the government on this issue for years, starting even before the last election. In 2010 they co-published a report with the Canadian Centre for Policy Alternatives outlining how this bottomless definition of election advertising chills political speech among civil society organizations. FIPA was also an intervenor (with Fair Vote BC and others) when the government’s 2012 amendments to the Act were referred to the B.C. Court of Appeal (those amendments, for the record, didn’t fix the missing spending floor). Finally, in early January, when FIPA’s legal council asked the government for a justification of their refusal to address this problem, their lawyers claimed that the Act was valid and insisted that if there was a problem FIPA should take them to court -so they did. And as if the delays and the stubbornness weren’t enough, it’s worth remembering that a few months ago, Attorney General Shirley Bond promised to bring forward legislation to establish provincial elections to fill Senate vacancies. Elections BC even received a million dollars to prepare for them. It would appear that the government is so deeply committed to democracy that they’re willing to drop $1 million into the possibility of Senate elections, yet won’t fix their truly unconstitutional Election Act, even with a provincial election looming. If the government has the time to deal with a theoretical Senate election, it should have the time to fix an actual Charter breach that compromises the free speech rights of British Columbians. And they should do it before the next election.